The Original Platform Bed is both sturdy and stylish making it one of our most popular beds to date. This Collection Platform Sleigh Bed Features a Curved Headboard giving You a Updated Urban Feel. Is finished in a Deep Cappuccino. Queen Size Bed: 87 x 63 x 50 1/2 In. (H). Nightstand: 23 1/2 x 16 1/2 x 25 In. (H). Dresser: 62 3/5 x 17 3/4 x 35 In. (H). Mirror: 34 1/2 x 40 In. (H). Chest: 36 3/5 x 17 3/4 x 54 In. (H). This Bed is A Low Profile and Open Grid, Wood and Meatal Headboard Forage the sleek Look of contemorary Design. Platform Bed has a strudy well Constructed Wood Frame finished in a Cappuccino. Queen Size Bed: 87 2/8 x 64 1/2 x 44 3/8 In. (H). Nightstand: 24 x 18 x 26 1/2 In. (H). Dresser: 64 x 18 x 34 1/2 In. (H). Mirror: 34 1/2 x 40 In. (H). Chest: 38 x 18 x 52 In. (H). Made of strong metal slats offer support and durability. 5-PC Symphony Bedroom Set made From Selective Hardwood With Veneer Tops In A Cappuccino Finish. The Drawers Have Side Glides With Nylon Rollers Plus Drawer Stops. 5-Pc Bedroom Set Includes: Queen Bed, Nightstand, Dresser, Mirror And Chest. Also Available (Not Included In The Price) Standing Mirror. Details: Queen Bed: 81In L x 61In W x 44In H - 15In H..Nightstand: 25In W x 16 1/2In D x 24In H..Dresser: 61In W x 17 1/2In D x 34In H..Mirror: 34 1/2In W x 39In H x 4/5In D ..Chest: 34In W x 17In D x 53In H..And Standing Mirror: 64In H x 21In W x 1In D. Strong Construction. Easy To Assemble. Queen Size Platform Bed In Chrome Finish With Two Black Leather Panels Head Board. Size: 63 1/2In W x 39In H. Strong Construction. Contemporary Design Queen Size Platform Bed With Wooden Grill Headboard And Structure In Grey Silver Metal Finish. Size: 33 3/8In W x 35 1/2In H. Strong Construction. Streamlined Glossy Silver Platform Bed With with Three Curved Bars Support. Size: 87In L x 66 3/4In W x 36In H Strong Construction. Contemporary Silver Platform Bed With Support. Size: 85In L x 66 1/2In W x 35 1/2In H. Strong Construction. Jarkarta Bed. Includes Headboard, Footboard, Slats, Legs and Side Rails. Headboard: 46H. Strong Construction. Available in Two Colors. Java Bed in Black and Mahogany Finish. Includes Headboard, Footboard, Slats, Legs and Side Rails. Headboard: 46H. Available in Full, Queen and King Size. Strong Construction. Key West Bed in White Wash. Includes Headboard, Footboard, Side Rails and Slats. Headboard: 52H and Footboard: 33H. Also Headboard Is Sold Separately. Available in Full, Queen and King Size. Strong Construction. Kyoto Bed. Includes Headboard, Footboard, Slats, Legs and Side Rails. Headboard:46H. Available in Full, Queen or King Size. Strong Construction. Platform Bed In Beautiful Design With Half Moon Design Headboard And Two Drawers On The Side.Size: Available In Full And Queen Sizes. *Local Delivery Os Store Pick Up Only. Click Here For Delivery Areas. Beautiful Queen Bed. Also Available (Not Included In The Price) Night Stand - 24 x 18 x 26H; Mirror - 37 x 48H; Dresser - 64 x 18 x 35H ; Chest - 36 x 18 x 52H. Strong Construction. Palazzo Bed in Gun Metal. Includes Headboard, Footboard, Slats and Side Rails. Headboard: 46h and Footboard: 26H. Available in Full, Queen and King Size. Strong Construction. Oak Finish Bedroom Set. Features Full/Queen/King Platform Bed (NO Foundation Needed), Nightstand, Dresser, Mirror And Chest. This Set Is Beautiful And Perfect For Your Bedroom. Strong Construction. Easy To Assemble.Details:Nightstand: 22 In. x 16 In. x 24 In. (H)Chest: 30 In. x 17 1/2 In. x 48 In. (H)Dresser: 58 In. x 17 In. x 35 In. (H)Mirror: 37 In. x 44 1/2 In. x 2 1/4 In. 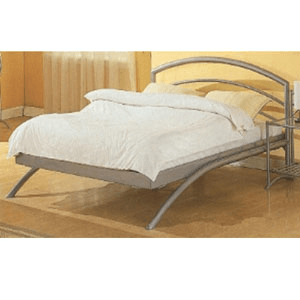 Indiana Queen Metal Bed (PI) 64W x 39H x 84D. Also Available in Twin and Full Size. Also Available (Not Included In The Price) Indiana 3 Drawer Nightstand - 23 5/8W x 25 5/8H x 15 3/4D, 5 Drawer Chest - 36 5/8W x 49H x 19 5/8D, 6 Drawer Dresser - 57 3/4W x 31 1/2H x 19 5/8D and Mirror - 31 1/2W x 35 1/2H x 1 1/4D. Easy To Assemble. Panama Bed in Curry Wicker/Acorn Trim/Gold Frost. Includes Headboard, Footboard Grills, Slats and Side Rails. Headboard: 70H and Footboard: 36H. Strong Construction. Our most popular item, the Nomad platform bed frame is made of smooth, clean, unfinished poplar hardwood by an American based company. Queen Platform Storage Bed. Includes Six (6) 19-Inch Deep Drawers, Three (3) On Each Side For Plenty Of Storage Space With A Slat Roll Support System. Bedroom Set In Cappuccino Finish. Features King/Queen/Full Size Bed, Nightstand, Chest, Dresser And Mirror. This Set Is Elegant And Perfect For Your Bedroom. Strong Construction. Easy To Assemble.Details:Nightstand: 22 In. x 16 In. x 24 In. (H)Chest: 30 In. x 17 1/2 In. x 48 In. (H)Dresser: 58 In. x 17 In. x 35 In. (H)Mirror: 37 In. x 34 In. x 1 1/8 In. Metal and Wood Platform Bed Available in Twin, Full and Queen. Easy To Assemble. Strong Construction. Comes with Headboard, Foot board and Spring Platform. Size Twin Size 39 In. x 75 In. Full Size 54 In. x 75 In. Queen Size 60 In. x 80 In. Casual Wood Bedroom Set. Featuring Checker Design and Stylish Hardwares In Maple Finish. Includes Queen Bed with Rails 8130Q (ML), Night Stand 8131 (ML) 26 x 16 x 24, Chest 8132 (ML) 36 x 18 x 52, Mirror 8133 (ML) 51 x 54 x 2.5, Dresser 8134 (ML) 68 x 18 x 36, Also Available Not Included In the Bedroom Set Price Armoire 8135 (ML) 42 x 22 x 66, Bed Slats 5108 (ML) and Blanket Chest 6054 (ML) 52 x 18 x 24. Also you can buy each Piece Separately. All Metal Platform Bed. Strong Construction. Easy to Assemble. Queen Size 60In. x 80In. Full Size 54In. x 75In. 5 Piece Coronado Transitional Wood Bedroom Set. Featuring Square Posts and Iron Works, In Pine Finish. Includes Queen Bed (w/ Rails) 8140Q (ML), Night Stand 8141 (ML) 28 x 18 x 26, Chest 8142 (ML) 33 x 18 x 56, Mirror 8143 (ML) 37 x 46 x 2 and Dresser 8144 (ML) 66 x 18 x 33. Also Available Not Included in the Bedroom Set Price Bed Slats 5108 (ML) and Bed Available in King Size 8140K (ML). Also You Can Buy Pieces Separately Check Options. 5 Piece Monterey casual Mission Wood bedroom Set. Featuring Solid Oa Posts and Stylish Hardwares, In Warm Oak Finish. Includes Queen Bed (w/ Rails) 8170Q (ML), Night Stand 8171 (ML) 28 x 18 x 29, Chest 8172 (ML) 38 x 18 x 54, Mirror 8173 (ML) 44 x 40 x x 2, Dresser 8174 (ML) 63 x 18 x 38. Also Available Not Included in The Bedroom Set Price King Bed 8170K (ML), Bed Slats 5108 (ML) and Armoire 8175 (ML) 42 x 23 x 72. You Can Also Buy Each Piece Separately Check the Options. Twin Bed and Daybed Complete with Bed Platform (Linkspring Not Needed), Featuring colorful panels with satin silver finish frames. Also available with Matching Night Stand and Underbed Drawer Unit (Not Included In The Price).